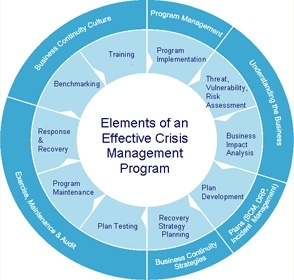 If your company only has a handful of customers/employees and the impact to the public if your services aren’t available due to a disaster is relatively minor – then a formal crisis management plan is probably not that crucial to your overall Business Continuity Plan (BCP). So, don’t bother reading any further. If, however, you have a large number of consumers/employees and a public facing set of services – A Crisis Management Plan (CMP) is a fundamental part of your BCP. All organizations must consider the threat of reputational damage, however, very seldom do they adequately prepare and/or exercise this scenario. Our professionals weigh in below on crisis management response and share how you can learn and incorporate these ideas into your BCP, Business Continuity Planning, strategies. Be quick to express disappointment and affirm the actions were against the organization’s core values – A charitable organization must be above reproach. Your Credit Union is no different. Your Credit Union has a mission and values statement. When it is breached, are you prepared to respond? Focus on what the organization has done (positive results) and will continue to do – Almost immediately, the Credit Union should construct communication pieces to educate the public on what it’s mission is (member service) and what their accomplishments have been to date. In a time of reputational crisis, it is important your members know that you are financial sound, ethically led, and operationally resilient. Take deliberate actions to distinguish yourself from the “threat” (perhaps a data breach or maybe a power outage). This isn’t a time to finger point, it distracts from the message you want to send. When your Credit Union’s reputation has been associated with a threat – real or perceived – Talk about who you ARE, not who you are not. Consider your worst case scenario – massive ID theft? Leadership wrongdoing and/or embezzlement? Draw up a scenario no matter how uncomfortable it makes you and develop a strategy for response. Exercise the plan – Once your scenario is developed, take time to exercise the plan and create muscle memory. Role playing is an effective method to assess your preparedness level for all risks including reputational. Can’t get started? Consider reaching out to experienced BCP planner to assist in developing and exercising this critical scenario. When an incident does occur – Don’t hide! Communicate quickly and at all levels – staff, members, board and public. All eyes are on you – turn this into an opportunity vs a crisis.